Crowd of people gathered outside of a mess hall, "Mess No. 2", possible for arrivals or departures from Rohwer concentration camp, Rohwer, Arkansas, July 26, 1945. A cluster of young men stand at BL. 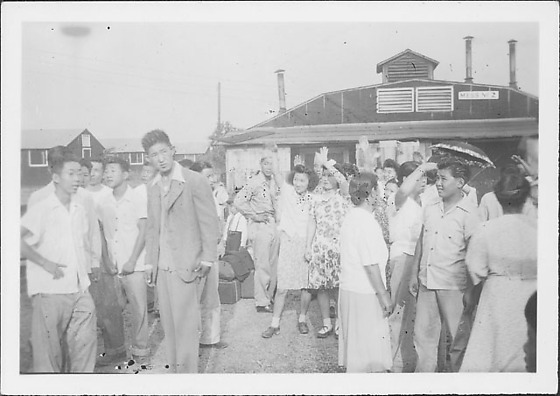 A man in military uniform stands between a pile of luggage and a group of women with their hands raised, waving, C. Top of umbrella visible at CR. Barracks in distance, L.
Stamped on back, C: JUL 26, 1945. Stamped on back, BL, blurred: "A.M."